Anything in the animal kingdom will do, it doesn't have to be a one layer this time but we still want to see that Clean and Simple style. Jen has had lots of changes going on in her life recently, the latest being a new job which she starts this week. This has taken lots of her time, leaving little for crafting and still less for commenting on LIM participants, so she will be taking a hiatus until things have become a little less frenetic. We are sure that you will all join us in wishing her well in her new role. I imagine I'll need a few celebratory cards for them. Memory Box sunburst meets Impression Obsession dog. 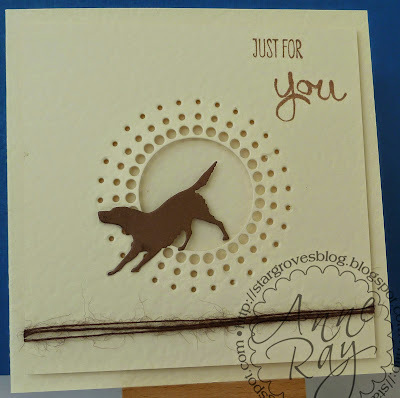 The rustic twine looks suitably hairy for a canine card! I found this digi image from Jane's Doodles, ready coloured in my drawer. SOmething I must have coloured quite some time ago and not used, so I thought it was about time I used it. The sentiment is from Walter and Winnie. I made the rainbow from Spellbinder circles, coloured with Mirage pens. I believe the clouds are from Die-Namics. Each week, we try to post additional examples of cards for the LIM challenges on our personal blogs. Many of you visit our blogs to leave a comment, for which we thank you most warmly. If you haven't yet managed to pop around to our blogs we would be delighted if you could, the names above our cards will link you directly to them. I love this theme and the DT cards are so cute! Fabulous cards the DT made. I visited all of their personal blogs. Thank you DT for your hard work. Fun challenge! I enjoy making my card!